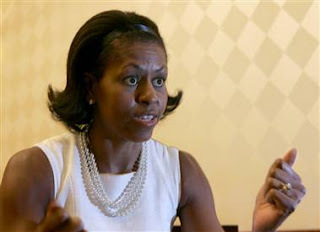 Breath of the Beast: What Did Michelle Obama Mean? I know that this is an unusual flurry of political response for this usually long-winded blogger- but the developments in the Democratic race are too fascinting to pass up. Judith Apter Klinghoffer has an interesting look at some of the background and history of Michelle Obama’s “jaundiced” view of America. My experiences at Princeton have made me far more aware of my 'Blackness' than ever before," she wrote in the introduction to her sociology thesis, "Princeton-Educated Blacks and the Black Community." "I have found that at Princeton, no matter how liberal and open-minded some of my White professors and classmates try to be toward me, I sometimes feel like a visitor on campus; as if I really didn't belong." Judith is right. Getting things that you don’t feel that you deserve is a kind of poison. The sad thing is that it could be very different for Michelle but she and her husband are locked into a joint career that is based on an unwholesome addiction to that poison. The most striking lesson here is that, no matter how many times it blows up in their faces, the progressive/liberal left always seems to choose the road that is paved with the gaudiest imitation of “best intentions” and leads most directly to hell. Affirmative Action, a trademark Democratic program, managed to take a perfectly smart, very charismatic young woman whose father had apparently worked hard all his life to provide her with security and opportunity into a confused and injured woman. In this and many other cases Affirmative Action has actually interrupted the healing process of generations of hard, honest work. Unless she confronts the harm that was done her and finds a way to, accept the gift that was given her and to reverse her ingratitude, each new degree of success will further deepen her self loathing and the expression it finds in the reflected disdain that she shows for “liberal and open-minded” America. One can only hope that having her unattractive and unpatriotic feelings exposed in this way will inspire her to open up a national discussion that will pierce the hermetic wall of politically correct silence around the Affirmative Action and race in general. She might never have a better opportunity to transcend her own pain and do something to repay this great nation for the privilege bestowed upon her. "...each new degree of success will further deepen her self loathing and the expression it finds in the reflected disdain that she shows for “liberal and open-minded” America." I think it is safe to sayt that "liberal and open-minded" is a position that occupies the centre-to-left in American politics. If this is an accurate estimate of what she feels about it, then whom does she like and respect? Where would she have to go in order to find the emotional harmony that she seeks? Your analysis of the psychological processes involved in Michelle Obama's comments, shame and feelings of inferiority projected and externalized onto the environment, is "spot on." Affirmative action continues to be more damaging than beneficial for its victims, I mean, beneficiaries. They struggle with feeling worthy because they always wonder if they could have succeeded on their own. As Shrinkwrapped noted, M.O. 's shame is projected onto everyone, for all the world to see. In a shame based world, it helps to remember that guilt is about what we do, shame is about who we are. Ms. Obama is living in shame, not knowing what she could have done with the application of her intellect. Brilliant diagnosis of the vagaries of human nature, YBM. To address the questions of Contentious, I would add that usually when people come against that dark recognition of 'everything they thought about life is not true' it becomes a personal spiritual quest for a true foundation. But, for the Obama's, even that spiritual cistern has been poisoned by the "unapologetically Black" teaching of their church. We should worry about the Obama's precious little girls indoctrination as much as we wept for the innocent victims of the Branch Davidian torching. I have heard that when Barak's teleprompter runs afoul, his rhetorical flourishes descend into the usual leftist Bush hate...Bushitler. So, what sort of leader would an affirmative action President be? From the depths of his heart a man speaks. Barak may make Jimmy Carter look good!